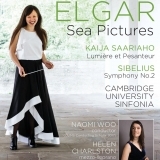 Cambridge University Sinfonia is a high-quality symphony orchestra, drawn from top student instrumentalists in Cambridge. 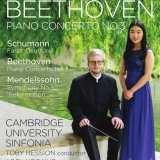 The Sinfonia performs a wide range of repertoire under its student Conducting Scholar and a range of prestigious guest conductors, which have recently included John Wilson, Sian Edwards, Sir Roger Norrington, Sir Mark Elder, Sir Richard Armstrong and Libor Pesek. 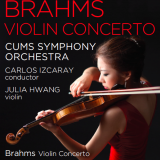 With each project, CUS members receive coaching from professional orchestral musicians. 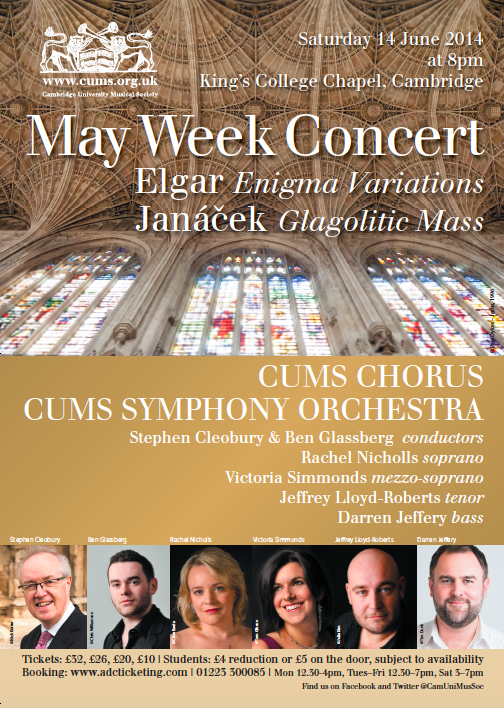 Cambridge University Sinfonia perform four concerts per year: two in Michaelmas term, one in Lent term and a May Week Concert at the end of the year. CUS have also enjoyed highly successful tours over the past three years, and are looking forward to travelling to Prague in July 2017 (see the ‘Tours’ tab for more details). But this new season promises more! 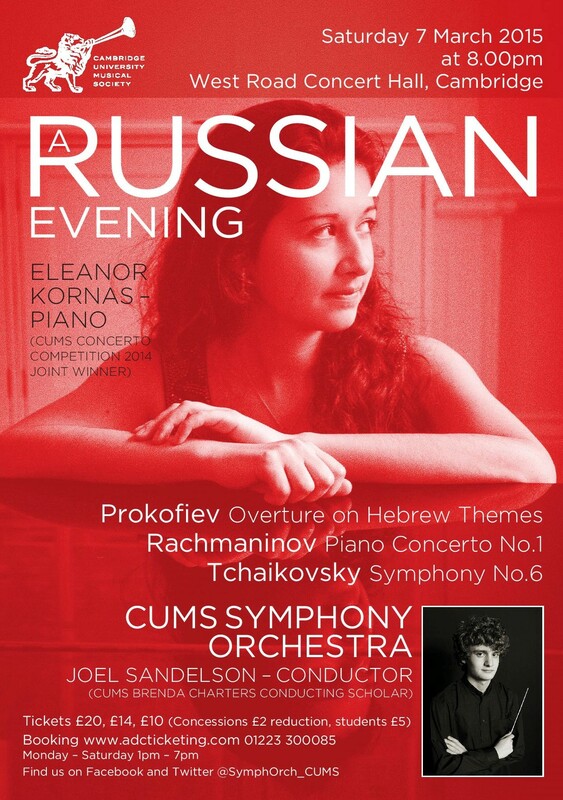 Our 2018/19 programme will be quite the kaleidoscope of orchestral music, with a focus on the music of Russian composers. 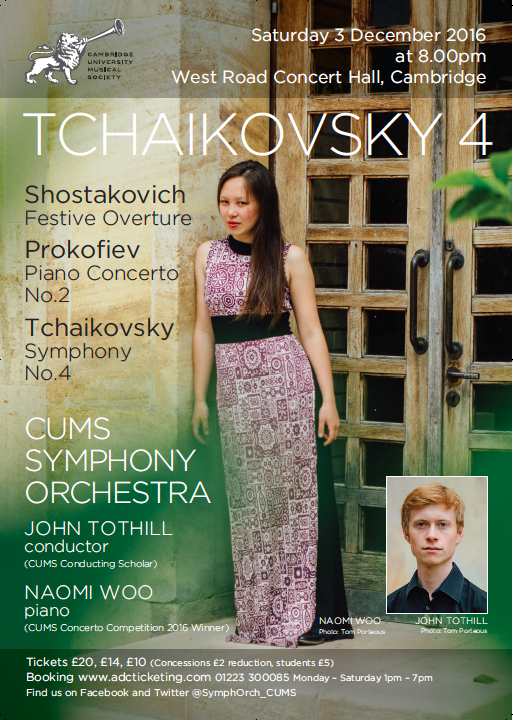 We will have the opportunity to work with musicians such as Holly Mathieson, Ryan Wigglesworth and Sir John Tomlinson; along with our finest student musicians, including our conducting scholars and the winner of last year’s CUMS concerto competition. 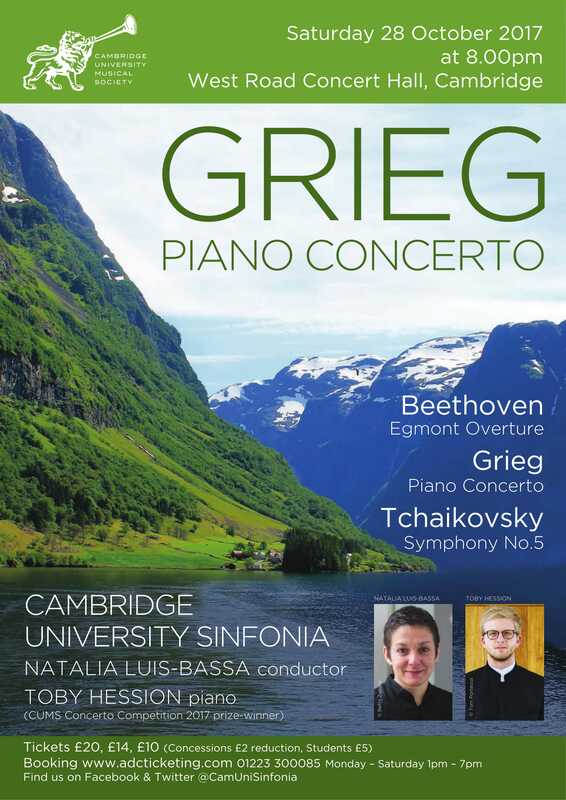 We will also join forces with our friends at the Cambridge University Orchestra for a performance of Britten’s War Requiem in the Lent term. 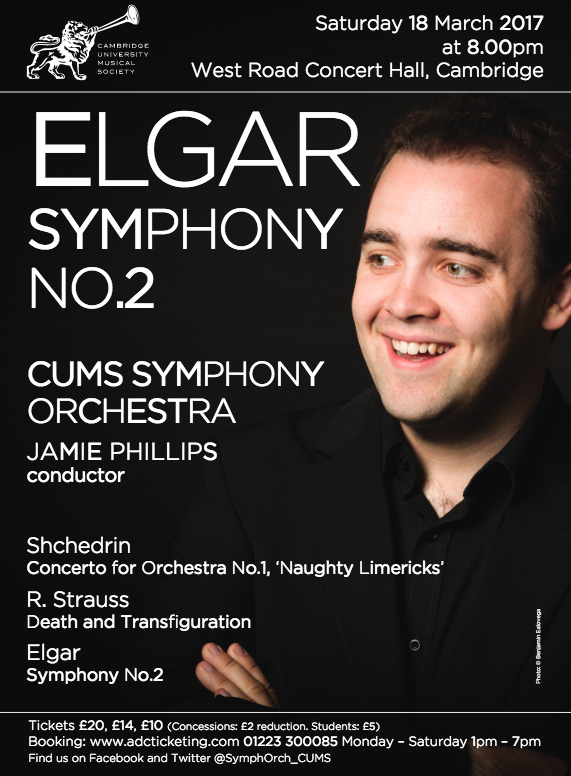 The benefits of joining our orchestra, of course, are not just limited to the quality of the final concert. During our rehearsal period, we are coached by accomplished professional instrumentalists, and membership of the orchestra also means strong friendships between musicians, which we celebrate in our various social events. 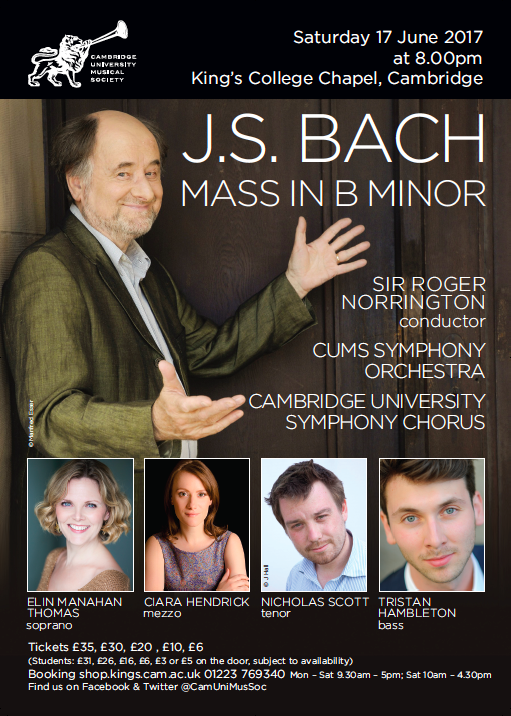 I greatly look forward to welcoming you to our new season, and I encourage those interested in joining us to find us at the Freshers’ Fair and sign up for an audition! 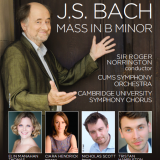 For more information about the Sinfonia please contact Rachel Becker at rnb28@cam.ac.uk. In 2017, the CUMS ensembles were restructured (for more details please see the Ensembles introduction). 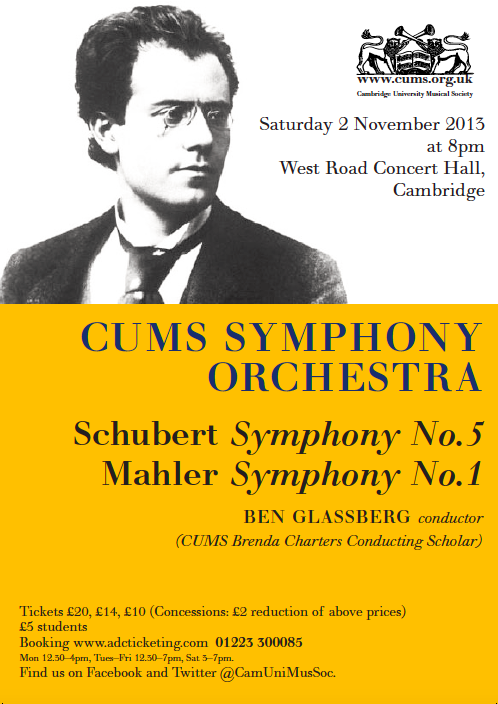 Previously, the Society had three orchestras: Cambridge University Chamber Orchestra, CUMS Symphony Orchestra and CUMS Concert Orchestra. 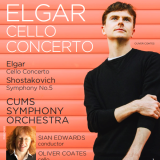 The Society now forms just two orchestras from the same body of players: Cambridge University Orchestra and Cambridge University Sinfonia. 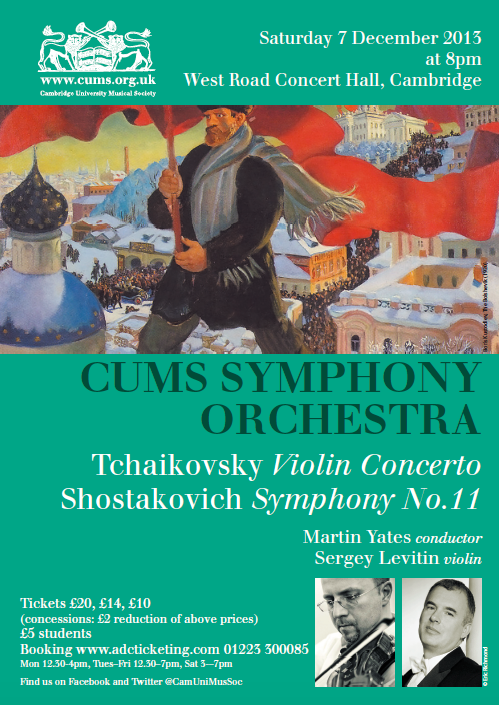 The Sinfonia performs the same number of concerts as CUMS Symphony Orchestra previously did and is largely made up of CUMS Symphony Orchestra players, but it is a more flexible ensemble. 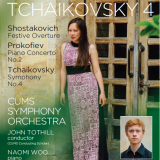 This enables some players to move between CUO and CUS throughout the year depending on the repertoire which is being performed. 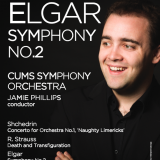 Find Cambridge University Sinfonia on Facebook and Twitter! 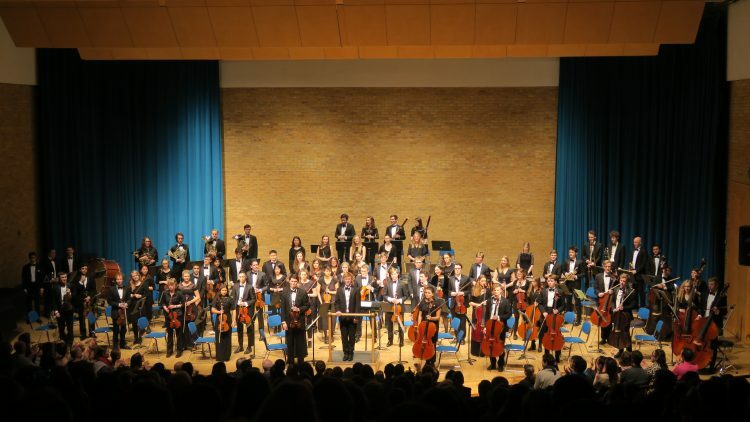 Blog post: President Sacha Lee talks about why the orchestra has become such an important part of her Cambridge experience. 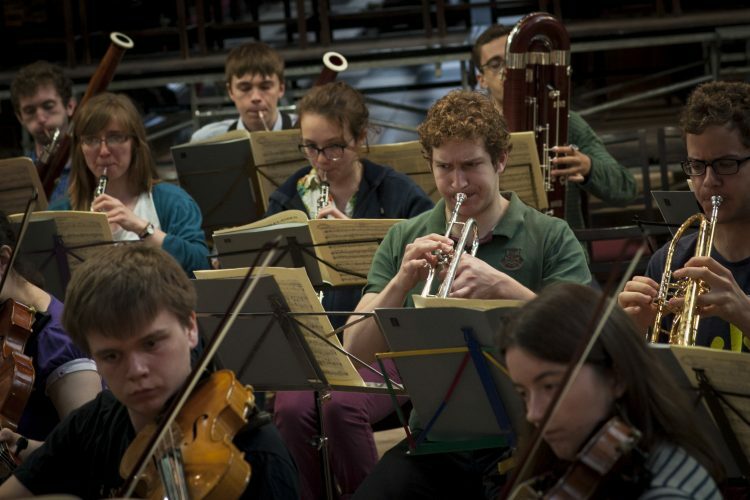 Interview: Social Secretary Jeremy Judge describes life as part of the orchestra. 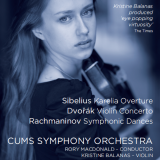 Read about the orchestra’s involvement in the Icarus project. 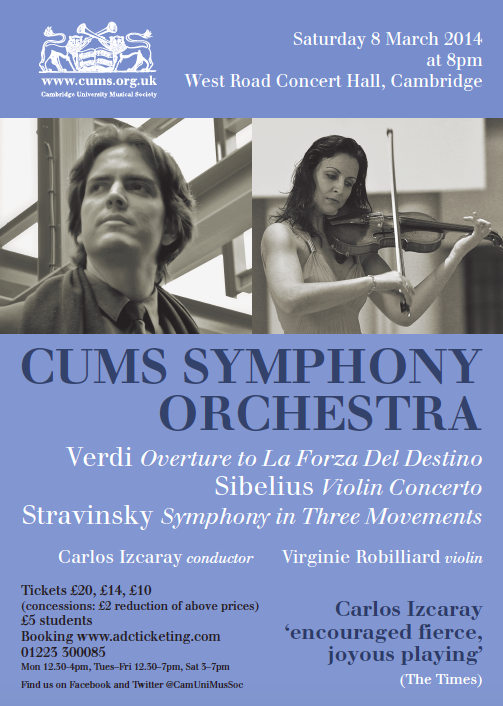 We are very pleased to share clips of the recording of the Symphony Orchestra concert, with conductor Carlos Izcaray and violinist Virginie Robilliard which took place in West Road Concert Hall on 8 March 2014. The recording was by Black Swan Productions and we are grateful to Carlos Izcaray for giving us permission to show these clips. 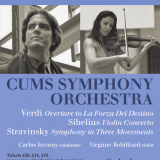 This July, the CUMS orchestras united for a five-day tour of Tuscany. We played three concerts to rave reviews – after our first concert in Montecatini Terme, several audience members drove to the nearby town of Pescia the next evening to hear us perform again! And in Pescia we were also welcomed with open arms by a standing-room-only audience and the mayor, as well as a late-night pizza party. The tour culminated in a performance at the prestigious 43rd Cantiere internazionale d’arte in Montepulciano. 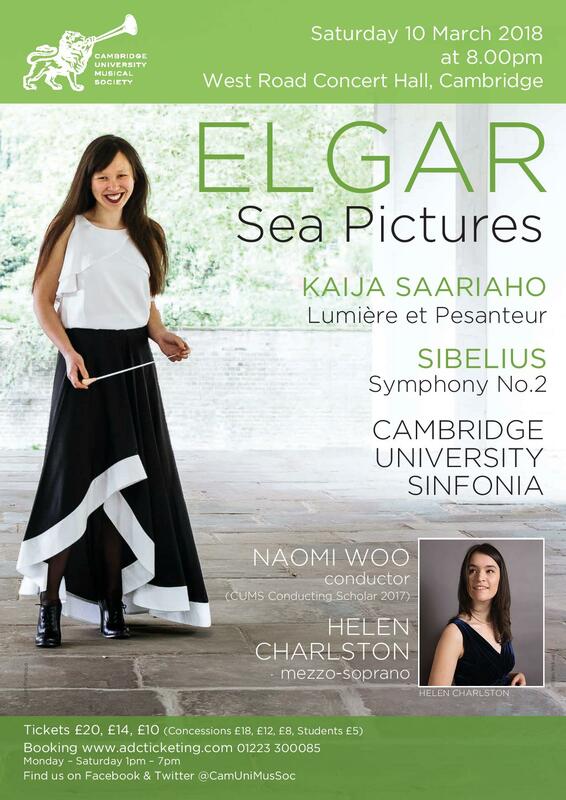 Huge thanks to our conductor, Naomi Woo, for such a fabulous musical experience! 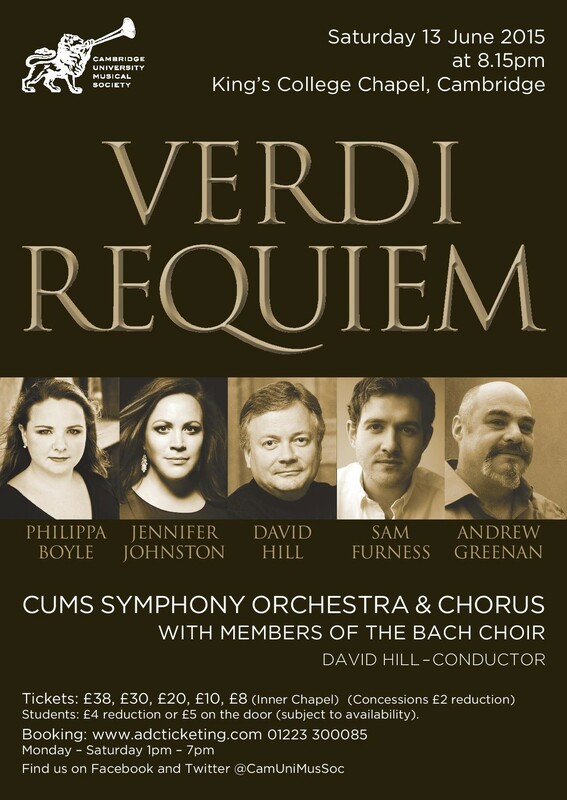 Alongside our concerts, we were able to experience the breath-taking art and architecture of Lucca and Florence, to take a dip in the Mediterranean, and of course to enjoy plenty of wine, pasta, and gelato. 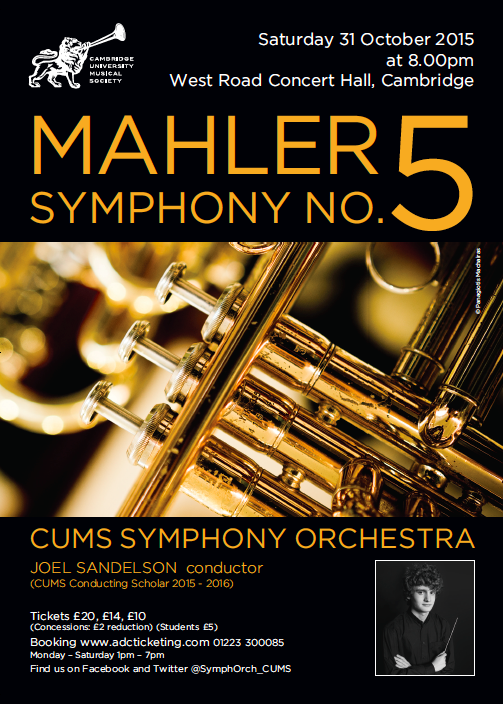 In July 2016, CUMS Symphony Orchestra set off for Germany, where they gave three outstanding concerts under the baton of Joel Sandelson. 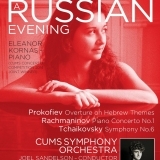 The orchestra performed an all-Russian programme including Tchaikovsky’s The Tempest and Rachmaninov’s Symphony No.2 to large audiences in Cologne, Andernach and Bonn. 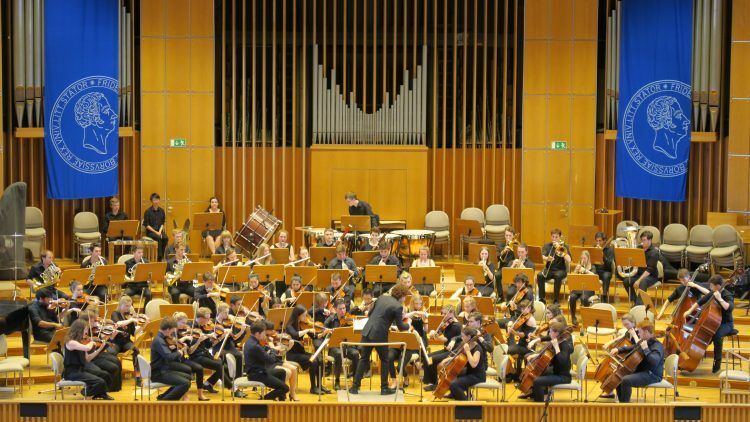 Performing in the impressive Bonn University Hall was a particular highlight. 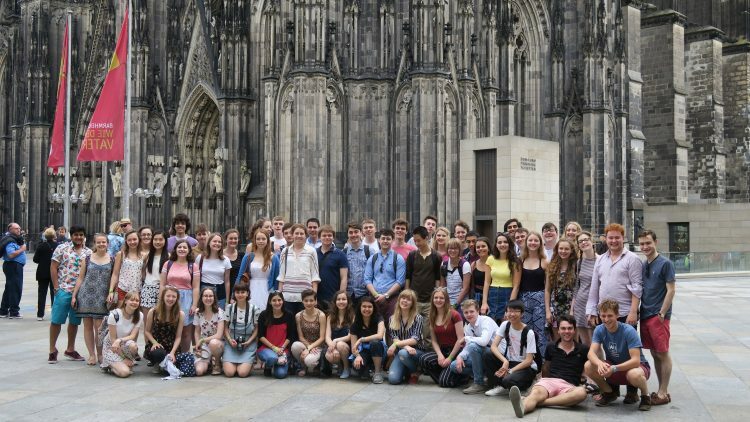 Outside of the busy concert schedule, there was time for a number of leisure activities: climbing up Cologne Cathedral, watching the famous Andernach cold water geyser, visiting Beethoven’s birthplace in Bonn and, of course, sampling the German beer! 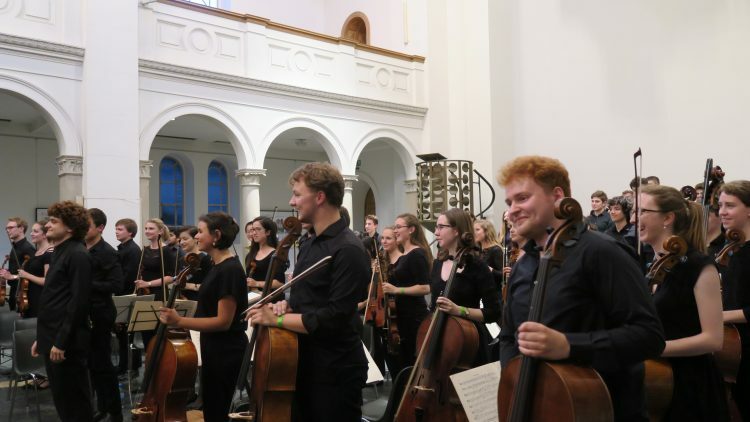 CUMS SO spent five days in Amsterdam, where they performed Elgar’s ‘In the South’ and Tchaikovsky’s Sixth Symphony, conducted by Joel Sandelson. One of the concerts was broadcast live on local television. 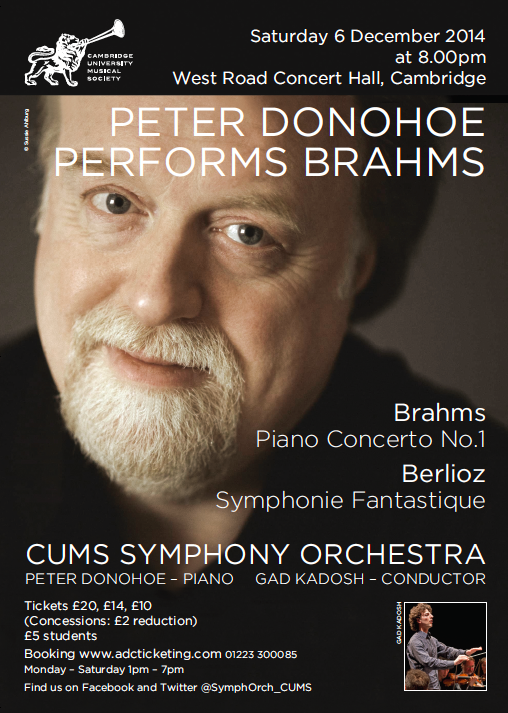 CUMS SO performed Tchaikovsky’s 1812 Overture, Elgar’s Enigma Variations and Ginastera’s Estancia Suite in Ghent, as part of the Gentse Feesten. 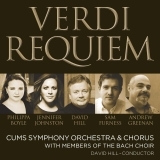 Each CUMS ensemble has its own student committee, which runs the ensemble’s rehearsals, concerts and social events. 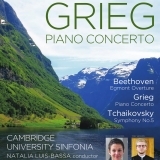 They are supported by the Concerts and Marketing Assistant (a graduate role), the Performance Assistant (a joint role with the Faculty of Music) and the Executive Director. If you would like to get in touch or have a suggestion about the ensemble, the Ensemble President is a good place to start. For more information on how CUMS is run, please see the Society Information page. The rest of the student committee will be elected at the start of Michaelmas Term. 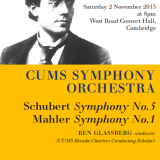 How can I perform with Cambridge University Sinfonia? If you wish to be considered for a place in CUS, you must audition. CUMS Auditions take place at the start of each academic year, during Freshers’ Week. 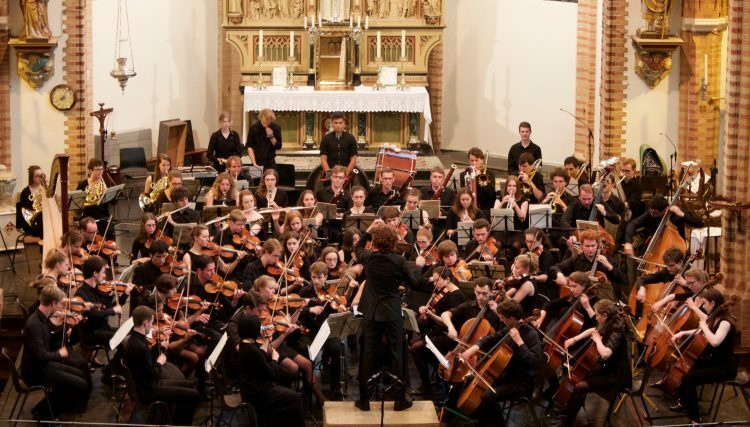 All members of the previous year’s orchestra must re-audition along with the new players. For more information about auditions, including how to sign up, please see here. How are CUS places allocated? 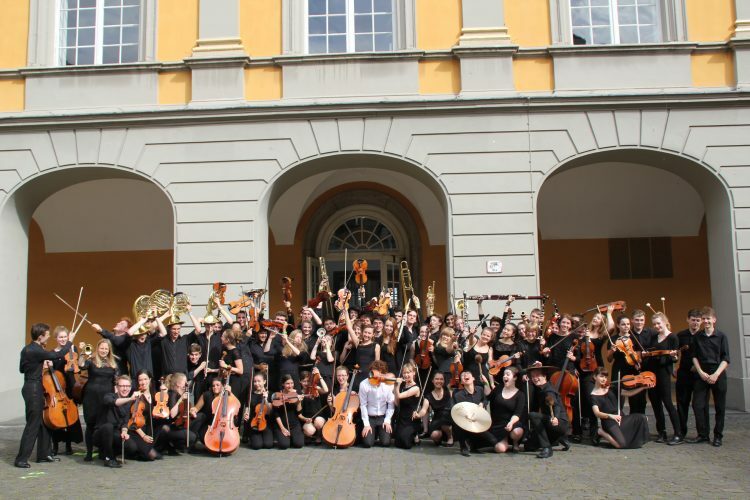 CUS is a flexible ensemble which works in conjunction with Cambridge University Orchestra (CUO). 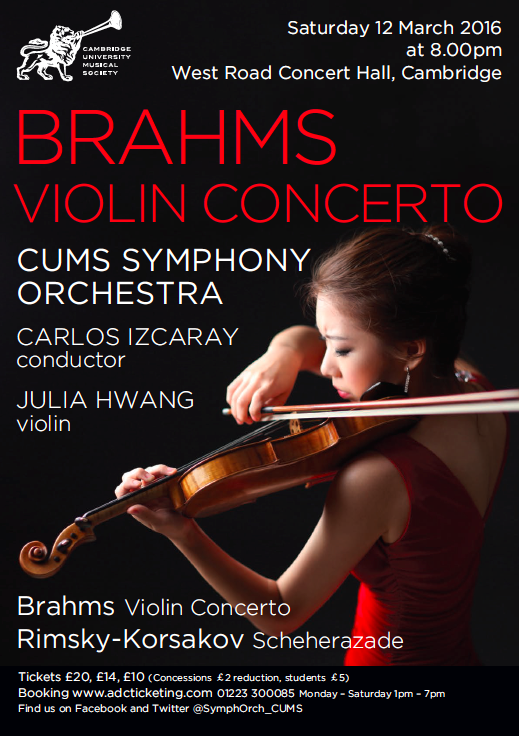 When you audition for CUMS, if successful, you will be offered places in a number of concerts for the entire Season. Some players move between CUO and CUS throughout the year, some play in CUS for the whole year and some join CUS for one concert per term. 1. 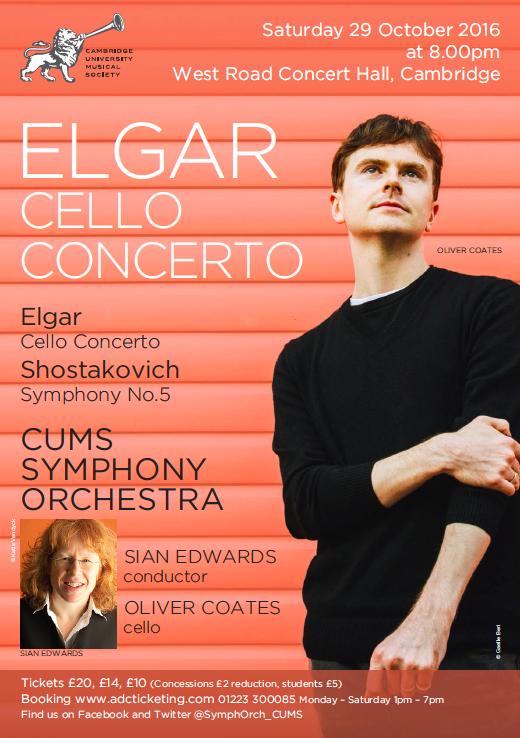 A place in all CUO concerts for the year (both chamber and symphonic – October 2018, November 2018, January 2019, February 2019, March 2019, May 2019). 2. 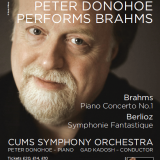 A place in all or most CUO symphonic repertoire concerts (November 2018, January 2018 and February 2018), and a place in CUS when you are not performing with CUO (most likely, October 2018 and June 2018 – with a professional conductor and ‘intense’ rehearsal schedule). 3. 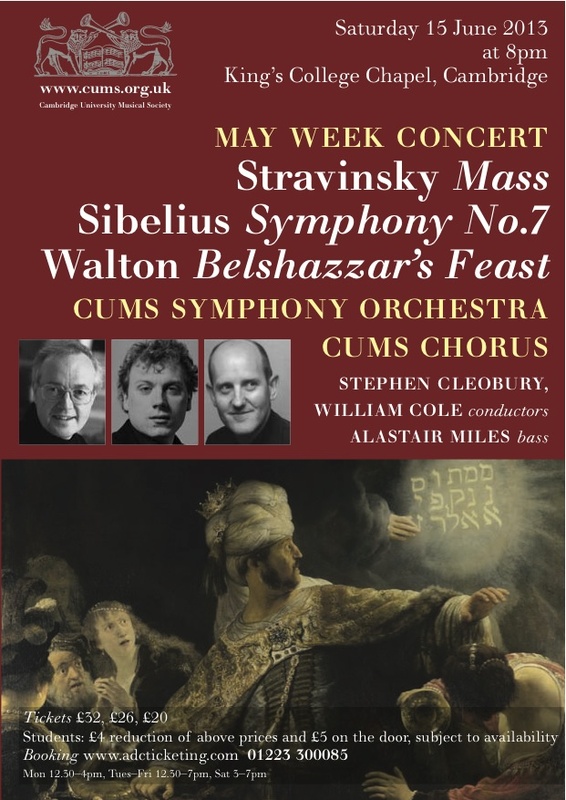 A place in all CUS concerts for the year (October 2018, November 2018, March 2019 and June 2019). 4. 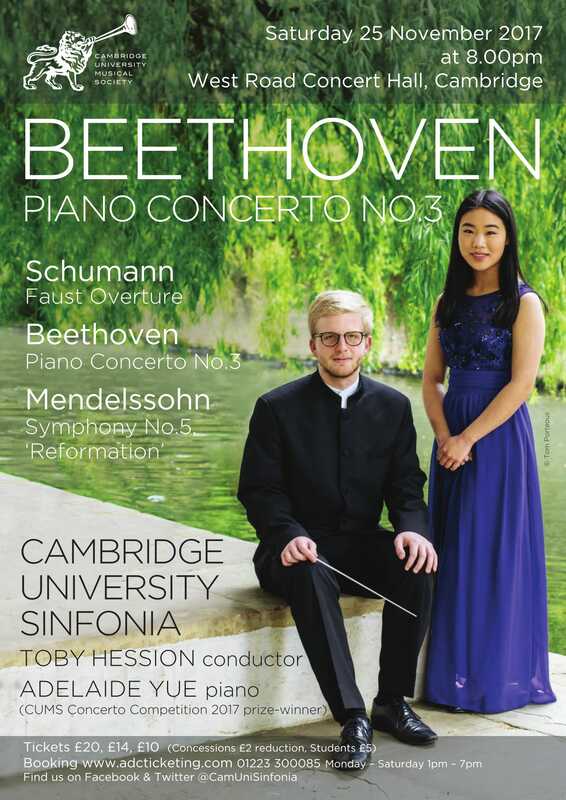 A place in two CUS concerts (most likely, November 2018 and March 2019 – with a student conductor and a more spread-out rehearsal schedule). 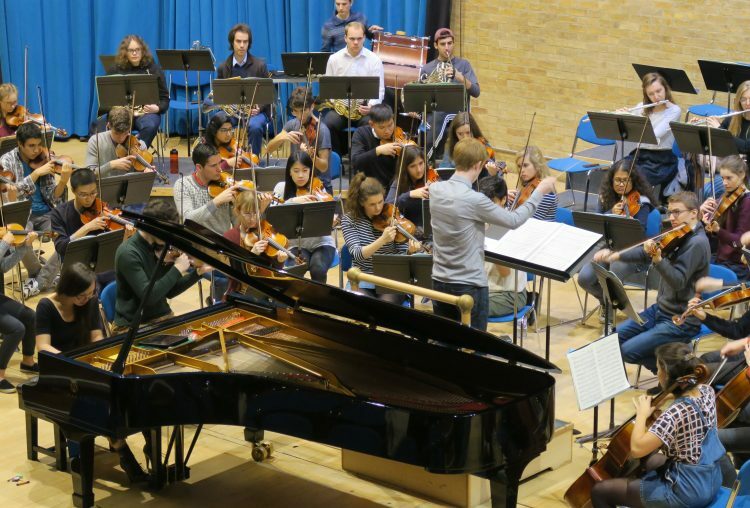 To view the 2017-18 rehearsal schedules for both orchestras, see here. Please note that there may be exceptions to these options for some instruments, depending on orchestration. 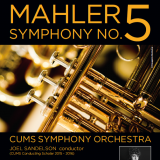 Your concert commitments for the year will be made very clear following your audition.